THANKS TO ALL OF YOU THAT MADE “VOLUNTEERS IN THE CAMAS” TRULY A CELEBRATION! THANKS TO ALL OF YOU THAT MADE VOLUNTEERS IN THE CAMAS TRULY A CELEBRATION! Over 300 people participated! Thank you to Mayor Nils Jensen and Parks representative, Hazel Braithwaite for opening words and to the Oak Bay Council, Oak Bay Parks Recreation and Culture Commission and Oak Bay Parks Manager, Chris Hyde-lay, for their permission and all their support. Also attending were Councillors Michelle Kirby, Tara Ney and Kevin Murdoch and Commissioners Matt Fairbarns and Suzanne Weckend-Dill. Partnering with Amanda Evans, leader of the Greater Victoria Green Team was absolutely the best! We enjoyed every thing we did together. Having her Green Team at Uplands Park events is also so much fun. By using social media so much, she brings in new volunteers of all ages, especially the young teaching them to love their Naturehood. The Bald Eagles were excellent…their music providing a sense of joy, a rhythm to the afternoon and happiness in everyone’s soul. Thanks to my incredible Friends of Uplands Park Steering Committee, Chris H-L, Ron, Chris G, Elizabeth, Anna, Cathy, Wylie, Matt and Rick who always “steer me in a corrected direction” and who were responsible for their own areas. Thanks to Kathleen Matthews for being our Social Media Manager and photographer and to Ida Spader for helping with family activities. Thanks to all who set up, took down and hosted tables. Thanks to our families…Tom, Eric, Jorey and T.J. for doing whatever they were asked. Thank you to the leaders of our Wildflower Walks, Matt Fairbarns and Wylie Thomas and to the leaders of the Bird Walk, Geoffrey, Jean and David Newell. 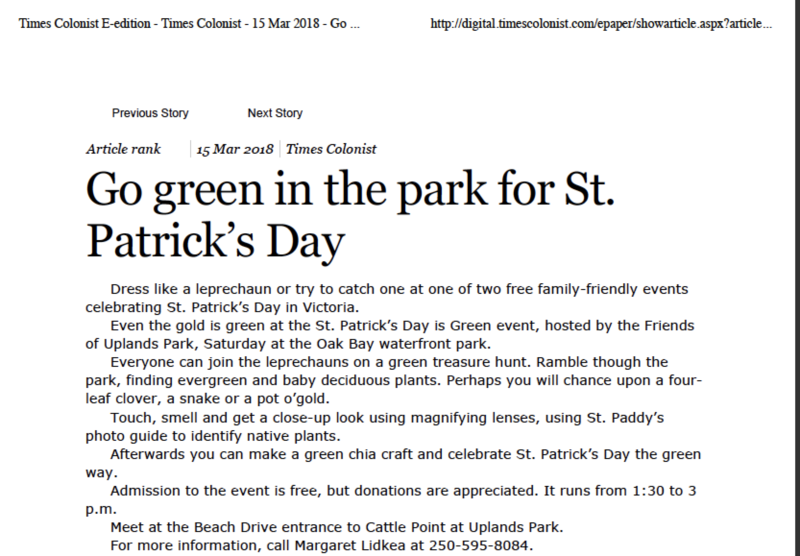 Thanks to Oak Bay News for their excellent article, recording interviews at the event and for their continued support of community events. Thrifty’s – $400 including a cake and 3 tents! Dominos on Foul Bay near OB Avenue provided 40 large pizzas! and to Home Hardware, OB Avenue for tool discounts throughout the year. We can thank them best by being their customers! FOUP’s “No Ivy League” is participating in the regional #Meadow Marathon. Volunteers welcome. Prizes too! FOUP’s “No Ivy League” is part of the #MEADOW MARATHON, and happens every Sunday from 1 to 3 pm. Meet at the kiosks on Cattle Point near the ocean. The Friends of Uplands Park’s very committed No Ivy League group resumes it’s weekly weekend invasive removal work on Sunday, February 4, 2018 from 1 – 3pm. 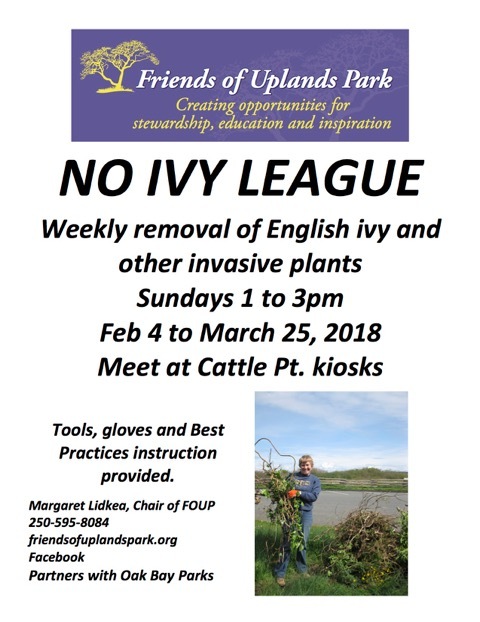 The goal is to focus primarily on the removal ivy and other invasive plants from Uplands Park and Cattle Point and these weekly sessions are making a difference. Please join us in this work. Tools and gloves are provided as well as the opportunity for learning best practices. Meet at the Cattle Point kiosks at the parking lot area down near the water. 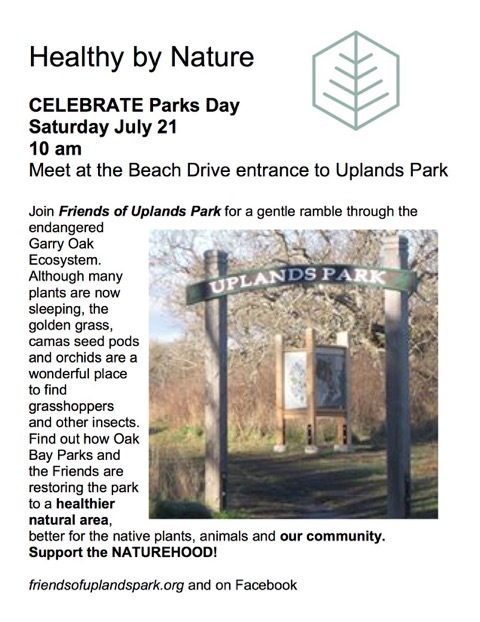 Invitation to help plant native species in Uplands Park in areas where invasive plants have been removed. 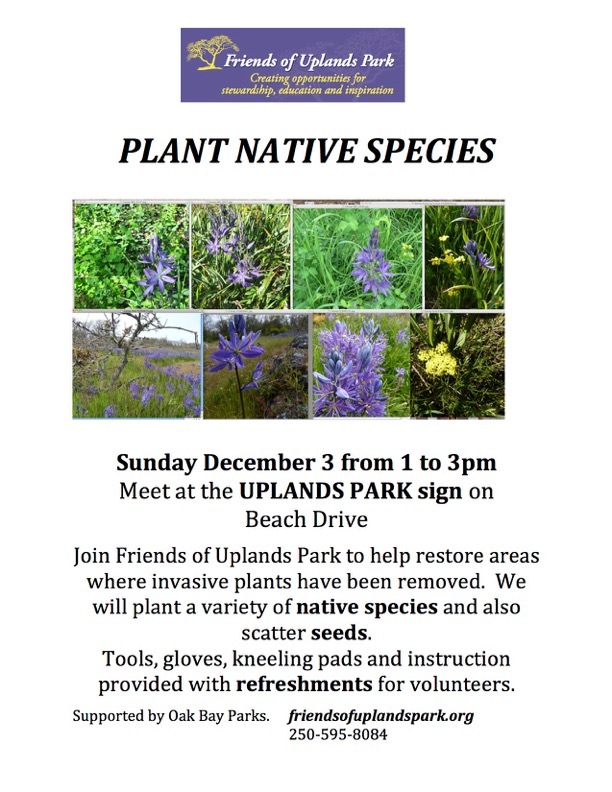 Meet at the Uplands Park sign on Beach Drive on Sunday December 3-2017 fro 1 to 3pm. 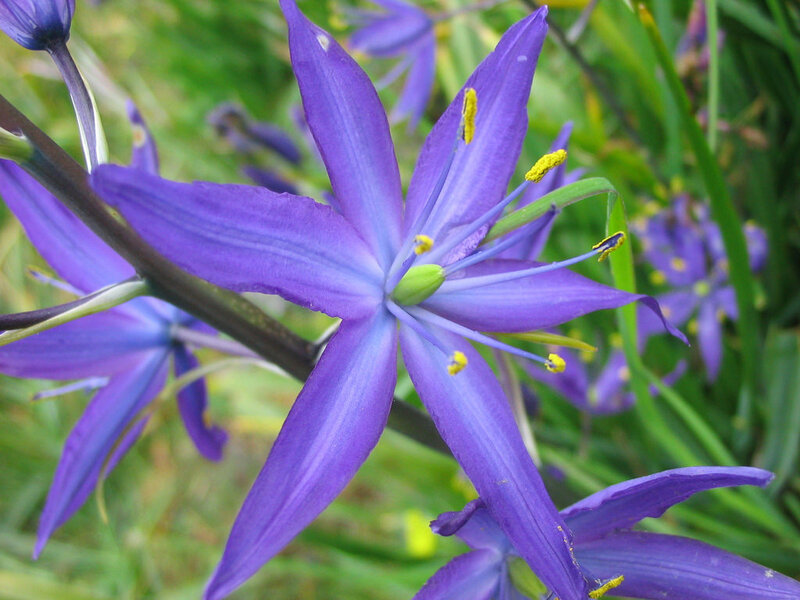 A variety of native species will be planted and seeds will be scattered in areas being restored. Tools, kneeling pads, instructions and refreshments provided for volunteers. 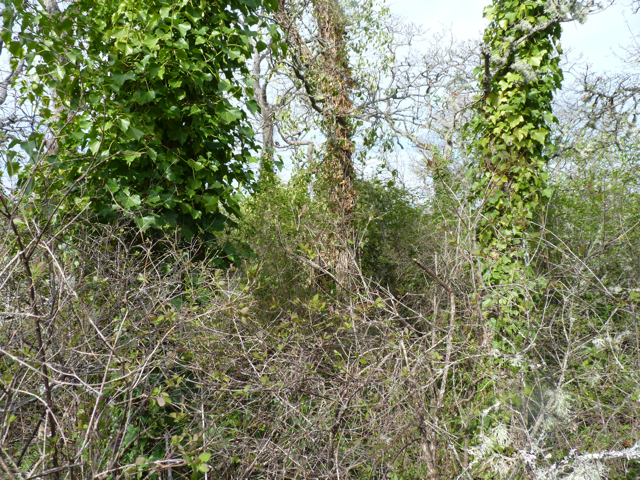 Join the Friends of Uplands Park each Sunday to remove English ivy. Removal of this highly invasive plant will help to restore the globally endangered Garry Oak Ecosystem of the park, and to protect the 24 rare plants. Tools, gloves and the Best Practices instruction are provided. Meet at Cattle Pt, near the kiosks. 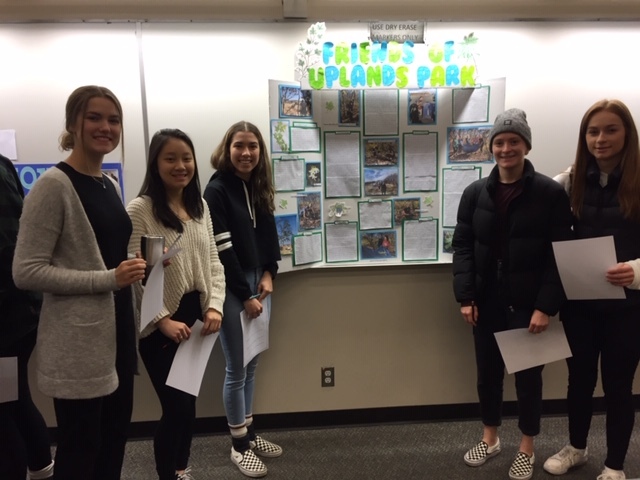 Thursday Oct 5 7 to 9pm Windsor Pavilion at Windsor Park in Oak Bay RESTORATION IN UPLANDS PARK Wylie Thomas, Steering Committee member, will give an excellent power point presentation of the invasive plant management in this special urban park with 24 rare plants, an endangered ecosystem and the recreational use of the community. He will focus on what has been done, and what he hopes will happen in the next year or so. 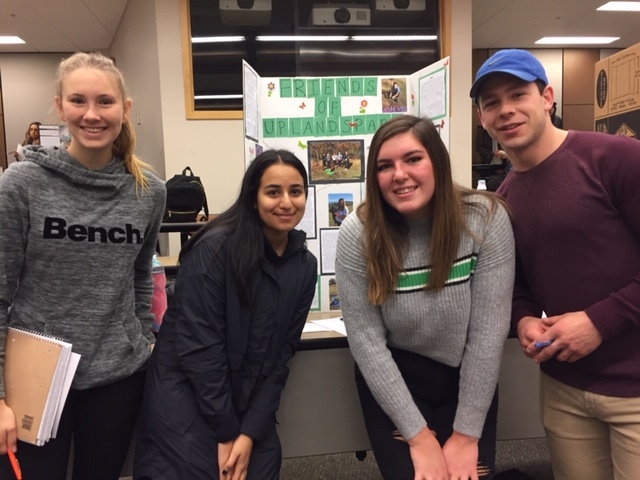 The second half of the program allows the audience to participate to share their concerns about some of the challenges in the park, so people should bring their enthusiastic ideas, possible solutions and compromises. Refreshments. 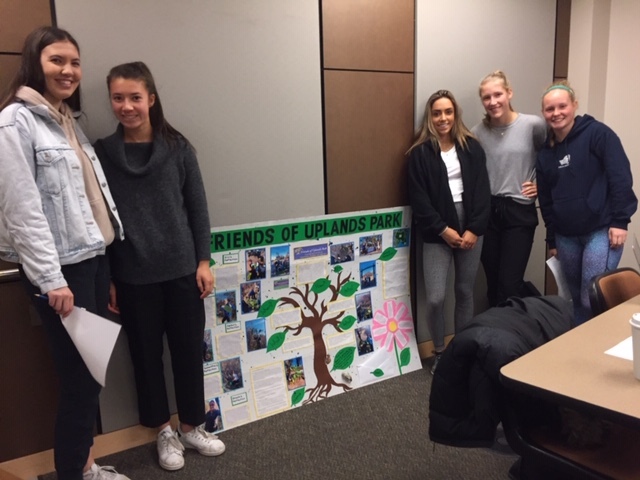 Donations to Friends of Uplands Park appreciated. Sat Oct 14 and Sun Oct 15 1 to 4pm. ANNUAL IVY BROOM BASH Join Friends of Uplands Park to remove a variety of alien invasive plants. Meet at the Information table on the field at the entrance to Cattle Point. Sign-in and become a Friend too. All tools, gloves and instructions are given. Refreshments. This is an excellent family and student opportunity. Saturday Oct 28 8am BIRDING IN UPLANDS PARK Meet Geoffrey Newell at Cattle Point for a gentle ramble through the park, noting new arrivals for winter. Dress for the weather, bring binoculars. Free. From Margaret Lidkea, FOUP Chair.